As we get closer and closer to the revealing of the Lord’s final events, let us look at the above map and the events therein. We as Seventh-day Adventists are well familiar with the 1844 date. This began our Lord’s coming to the heavenly Sanctuary to begin the judgment for the dead. All those who professed their belief in God began to be reviewed by the Judge. We are fast closing in on Christ’s last review of the dead. Then there is a transfer of judgement–the dead to the living! As shown in our profile this is when the four winds are let loose, Ezekiel 9 church judgment commences and the 144,000 are united and sealed. “…since the distinctive truth of the Investigative Judgment in heaven is the Seventh-day Adventist doctrinal magnifying glass, let us use it on the subject of the separation. That part of the Investigative Judgment of the living, by which is determined who are to have their sins blotted out and, as a result, be given eternal life, is paralleled on earth by the work of the angel with the “writer’s inkhorn,” who is charged to “mark” (seal) everyone who sighs and cries for all the abominations in Judah and Israel-the church. And the work of the five others who follow on to slay all who have not the “mark” (seal), is paralleled in heaven by the blotting out of the sinners’ names from the Book of Life. (See Ezekiel 9 Testimonies to Ministers, p. 445; Testimonies, Vol. 5, p. 211). Thus we see that this dual prophetic work of separating the names of the sinners from the names of the righteous in the sanctuary, and separating the sinners from the righteous in the church, is the same as the work decreed in the parables: separating the tares from the wheat (Matt. 13:30); the bad fish from the good (Matt. 13:48); those who have not the wedding garment from those who have it (Matt. 22:1-13), those who have not improved their talents from those who have (Matt. 25:20-30). As all these equivalent separations take place during the Investigative Judgment, before the wedding, the coronation, the reception of the kingdom (Dan. 7:9, 10, 13, 14), it is evident that the harvest and the Judgment are counterparts and that they take place before probation closes—when the Lord suddenly comes to His temple to “purify the sons of Levi.” Mal. 3:1-3. As we have posted many times before, the doubters of which are legion, in our SDA church, do not teach or discuss this very important transfer of Judgment. They are stuck on the judgment of the dead and do not generally have a clue about the judgment for the living. But Spirit of Prophecy shows a real “game changer” in the following Inspired reference. Here we see that the 144,000 sealings are one and the same as Ezekiel 9. This being so we can then know that the 144,000 are sealed prior to the Sunday law. Here are two most important references that supports this timeline. In Rev. 7 we find our evidence as to when the sealings/Ezek. 9 are done. It is before the winds are let loose. So what does the winds of Rev.7 represent? So the winds represent the Sunday law.Hence the sealing/Ezek. 9 take place before the Sunday law. The next reference backs this up as well. Although Ellen White was speaking in the terms of “we”, which would appear to say she was one of them, we know as Bible students that she was foreseeing into the future. Much like a reporter living vicariously through their report. We know as present truth believers that our beloved prophetess is sleeping peacefully in the grave but will soon join the servants of God in the final work upon the world. Let us now look at the middle of the chart, the most intense part. Once the “great and dreadful day of the Lord” commences, we see many simultaneous events occur.This is the time of gigantic unparalleled happenings worldwide. Words really fail to speak of these colliding of events. The world will be completely changed. The Loud Cry, the false Satanic kingdom, the Lord’s Israel kingdom, the miracles, the gathering of the great multitude, the Sunday law, all this and more happens within a few short years! The world will have witnessed the dreadful end of probation for the SDA church. Amazingly, because of this, there will be two dividing camps in the world. Those that believe the testimony of the 144,000 as God true servants and those who are skeptical and allow themselves to be fooled by Satan’s counter plan. Let us remember that as they say “hindsight is 20/20” and applies to those who do not know the future, but the Davidians SDA will be proven correct concerning end time events and as such, with the spreading of the prophetic events, videos, blogs, reports, all made prior to the events, this will solidify many truth seekers as to who is truly with God. These will be known as foresight 20/20 people. These 144,000 servants go to work bringing in the final “great multitude”(Rev. 7:9) from around the world. The Lord’s headquarters–Israel, will be the safe haven for all believers. Just as the SDA were the first to receive the final warning from a God who is exceedingly angry and fed up with sin, due to the continual abominations through out His church, so too will the world be warned by the 144,000 and should they reject the warning, the final wrath of God is poured out by the 7 last plagues. So we see that God’s servants have warned two groups, the SDA and the world. Two fateful eternal decisions are made–Eternity or non-existence. The plagues come upon all those who have rejected Christ, through the message of His servants, and then that glorious “second coming” appears to all the faithful –praise the Lord! 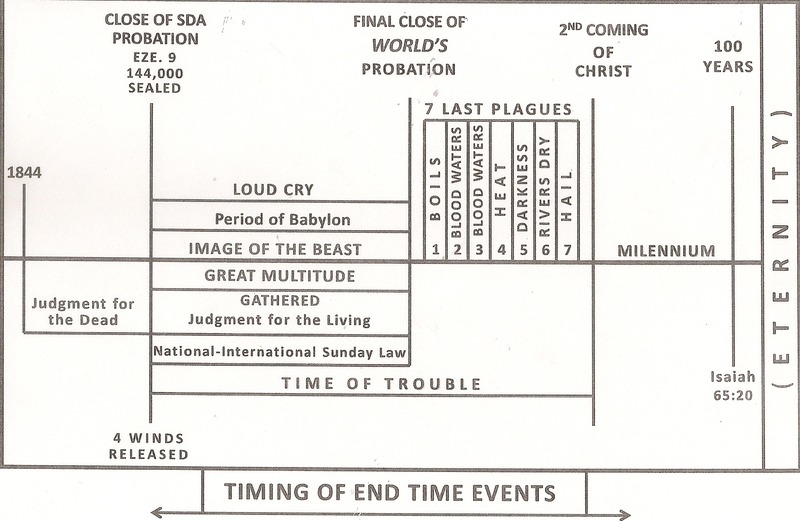 As the chart shows, there will be 1000 years in the heavenly kingdom, at which time the saints will have the privilege of reviewing God’s righteous judgments passed upon all whomever they will review. The end of this time will be the Lord’s kingdom descending down upon a people who are the raised wicked who were given 100 short years to witness the futility of a world without God. The short 100 years is generally not well know among us, and we hope to have a post on it soon. The understanding of this originally came from the Spirit of Prophecy. In closing, when we carefully study the Bible, Spirit of Prophecy and the Elijah message, we see that the shown chart outline is truly the timing of end time events. Let us determine to be part of this glorious end time world. Yes there will be a two-fold division, but those who make preparations now, and keep their garments clean and walk daily in His Commandments and sigh and cry for all the abominations that are done in their life and in the church–will witness it all! This entry was posted on July 11, 2015 at 4:03 am and is filed under End times, Final Events. You can follow any responses to this entry through the RSS 2.0 feed. You can leave a response, or trackback from your own site.